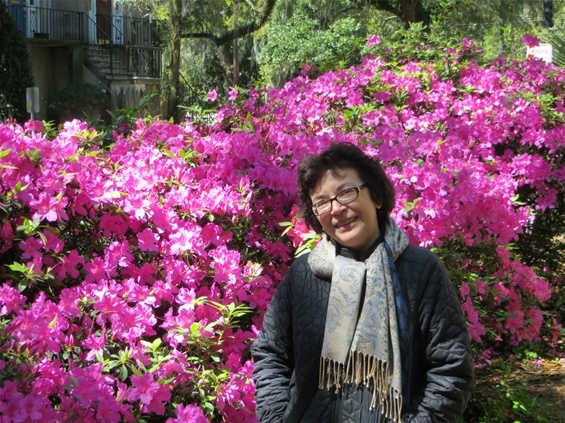 Cindy and I went to Savannah a few weeks ago. We wanted to get out of the worst winter in memory. Since my obviously smarter brother and his wife were down there for the season, it was a natural fit. 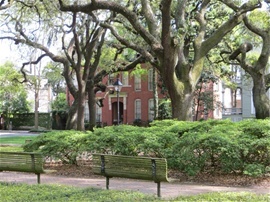 Savannah, on the surface, is a down-sized version of New Orleans. But if NO is the bawdy, brazen, bordello madame, offerring everything up for a price and leaving nothing to the imagination, then Savannah is the starched society matron, obsessed with surface appearances, leaving all else to the imagination. It offers itself up only (if ever) after much effort. 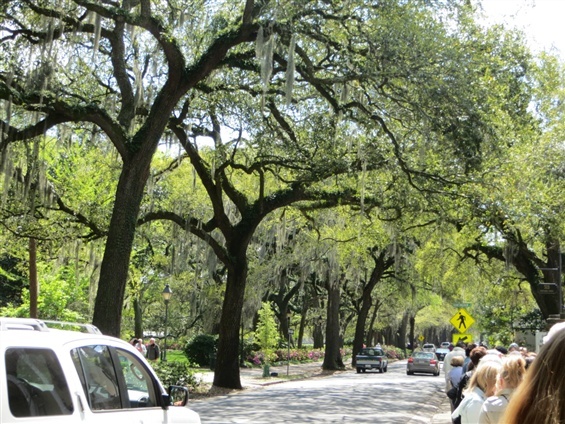 The commonalities are obvious: the weather (hot and steamy) the Spanish moss and the live oaks (although Savannah - rarely the victim of hurricanes - is blessed with a comparative abundance of these majestic trees) and their wrought-iron decorated historic centers. 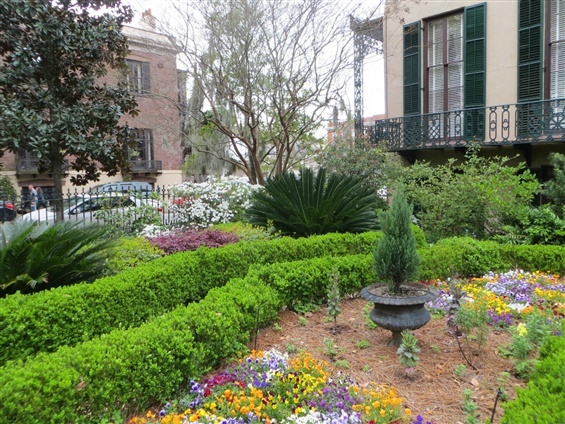 Savannah and New Orleans rose out of entirely different circumstances. New Orleans, at the mouth of the greatest waterway in North America, has been referred to as The Accidental City and throughout its French/Spanish/Catholic history seems never to have prohibited anything. Certainly not vice in any of its many wonderful forms. 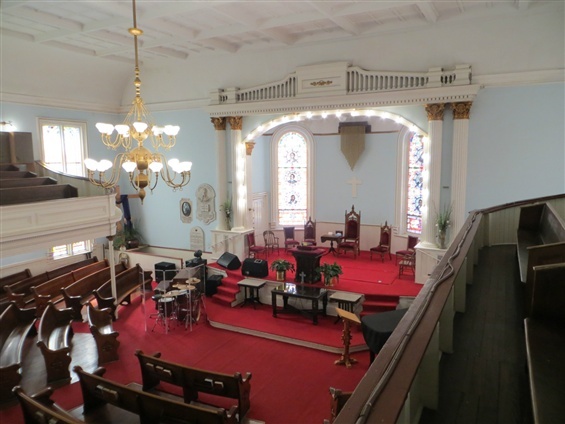 Settled by the English in the early 1700's, Savannah was the center of the last of the original 13 Colonies and was designed to be a model of Methodist sober self-reliance. The founding charter excluded Catholics (i.e. the Irish) slaves, alcohol and lawyers. Well, that was the plan anyway. After the first winter, when half of the original boat load of settlers died, the English realized they were going to need an infusion of new blood. Irish immigrants suddenly became acceptible . Today, nearly a quarter of the city is Irish and Savannah is host to the third largest St. Paddy's Day celebration in the US, topped only by New York and Boston. 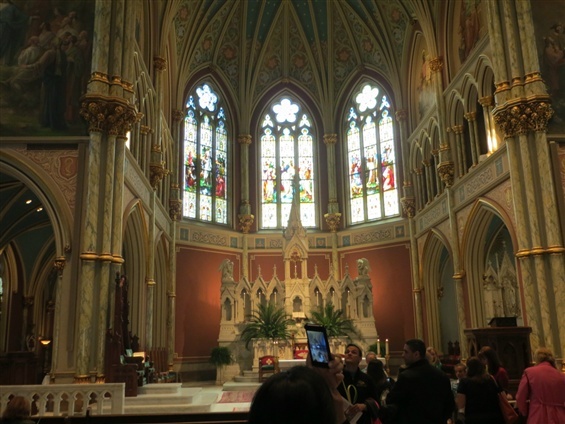 St. John The Baptist Cathedral is one of the South's oldest and most beautiful Catholic churches. Irish pubs are everywhere. It is legal to carry your drink on the street (as long as it's in a plastic cup). Slaves? Georgia and South Carolina are separated by the Savannah River. South Carolina had slavery and was booming economically because of it. 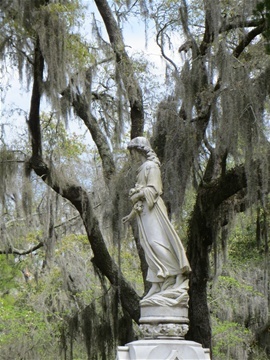 The founding fathers of Savannah looked across the river and recognized a money-making opportunity. Initially, the enslaved would be rented and simply brought across the river to work during the day and then returned to South Carolina at night. In short order, this cumbersome attempt to maintain the fiction of not allowing slavery in the new colony was abandoned. 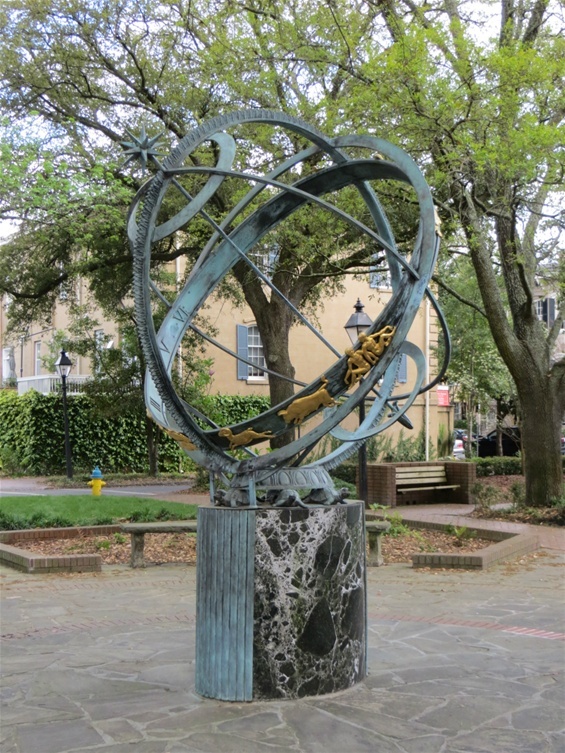 By the mid-1800's, Savannah was one of the principal centers of the slave trade in the world. Lawyers? Nobody's exactly sure how they got here but they are allowed to walk openly on the streets and are more or less well tolerated. 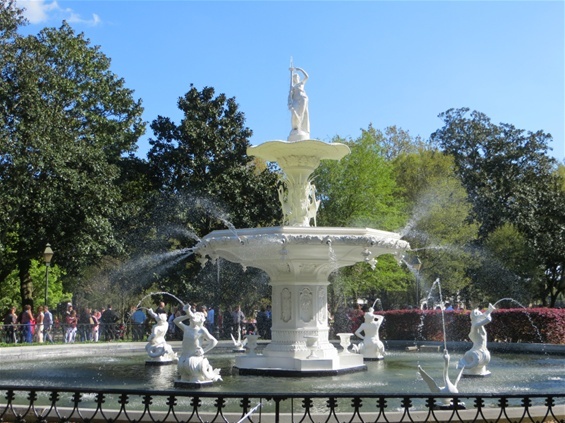 Savannah today is what it is because of three things: slavery, a women's bridge club and a best-seller about a gay antique dealer. 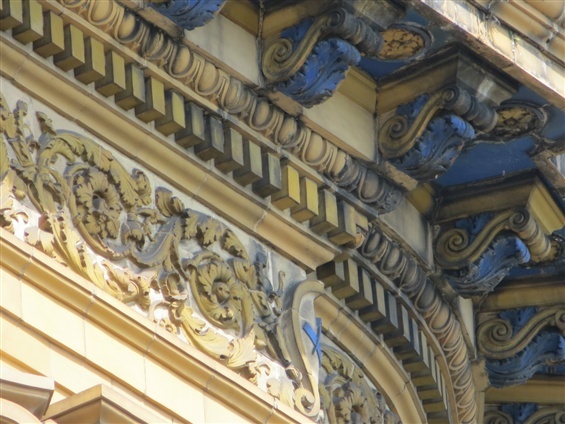 Savannah's 18th and 19th century development was fueled largely by slavery and the rise of King Cotton (the city's Cotton Exchange, a beautiful terra cotta building overlooking the river, still stands). It was a time when, for those favored by the accident of birth, fortunes could be made overnight (or at least after a few cotton harvests). 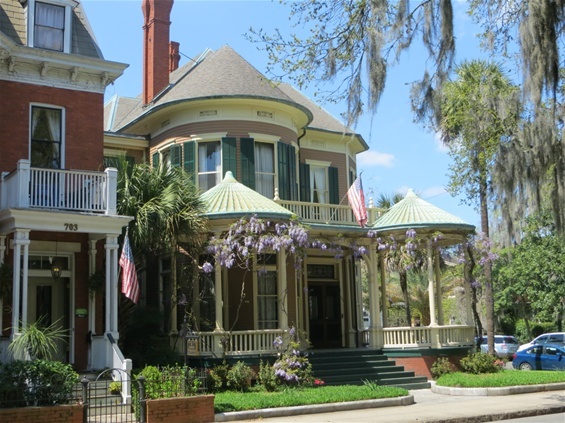 Magnificent homes (Savannah has hundreds of 19th century buildings, more than any city in the country) were constructed around the series of two dozen squares that were laid out as part of the original city plan. 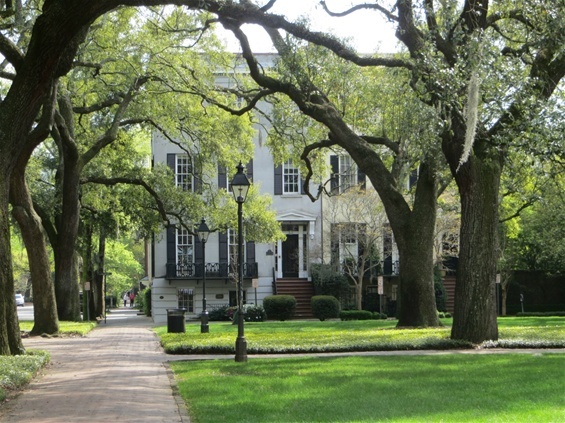 Today those homes and city squares are the heart of Old Savannah and are the key to perhaps the most beautiful city-scape in the United States - deeply shaded plots for rest, contemplation and public interaction the likes of which is virtually non-existent in most metropolitan areas. 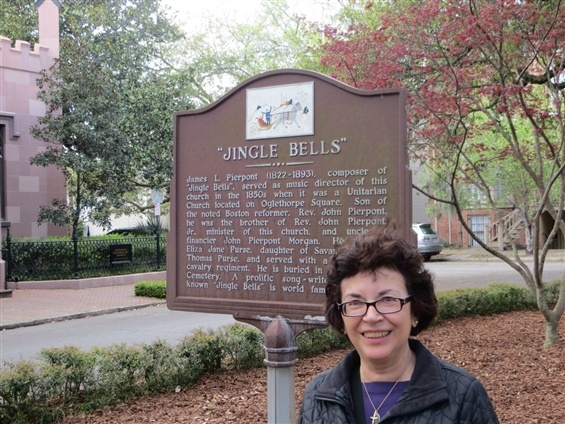 Savannah, like every city North and South, is still grappling with its racial past. 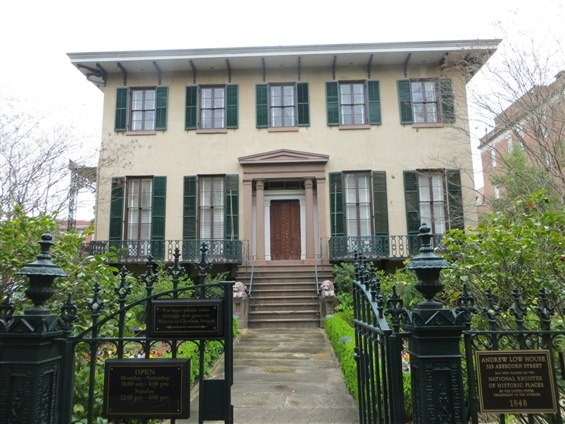 Docents will talk about "servants' quarters" as they usher you through the residential museums built of "Savannah bricks". 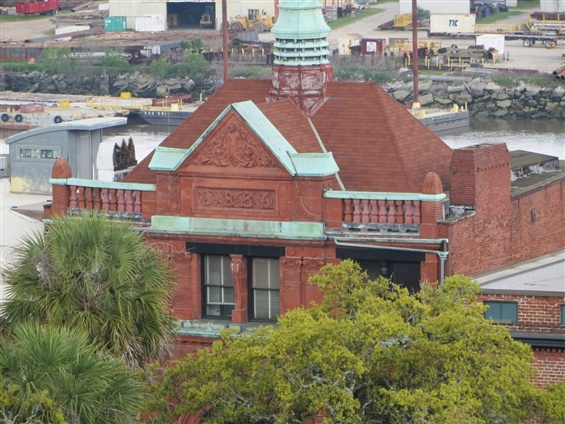 They note how the bricks (a particularly attractive shade of gray owing to the sand along the beaches and river banks near the city) were "hand made by slaves". True enough, the bricks were made by slaves but the picture conjured up is of an independent artisan leisurely creating a few dozen bricks a day in his shop rather than the endless, sweaty, back-breaking toil spurred on by the lash. It's striking when one encounters a more open acknowledgment of this brutal aspect of the city's past. 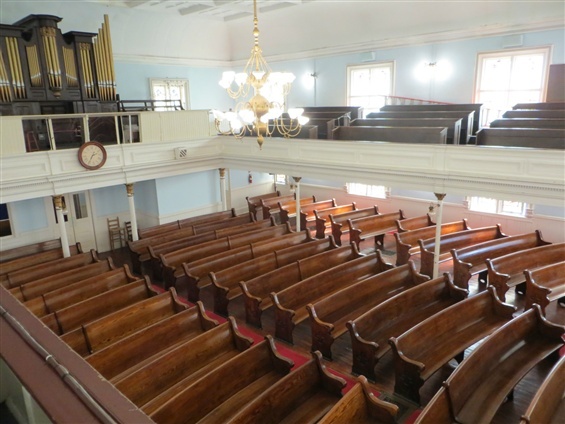 We witnessed it at the Mickve Israel Temple, a Gothic revival building that serves as the synagogue for the third oldest Jewish congregation in the United States. 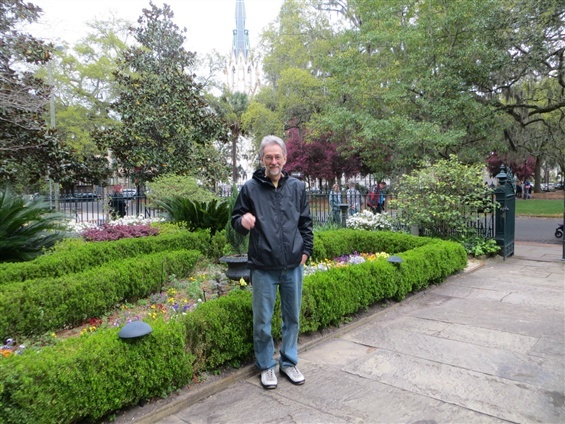 The guide, with rightful pride, detailed the significant contributions of the first Jews who came to Savannah immediately after the initial settlers - the first doctor in the colony among them. With resfreshing honest he also noted that many of that group and their descendants were also deeply involved in the buying and selling of other human beings. 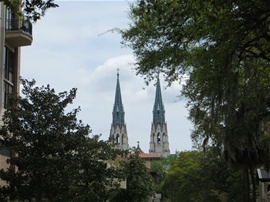 Savannah is the birthplace of the foundress of the Girl Scouts of America and, he added on a lighter note, the members of the congregation baked the first Girl Scout cookies. Yes, they're kosher. 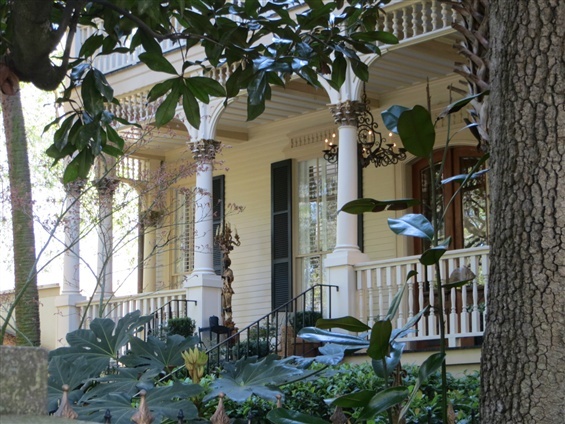 The Davenport House is ground zero for the historic preservation movement in Savannah. In the mid-1950's, when Progress had supplanted Cotton on the throne, this property was about to be destroyed and turned into a parking lot. 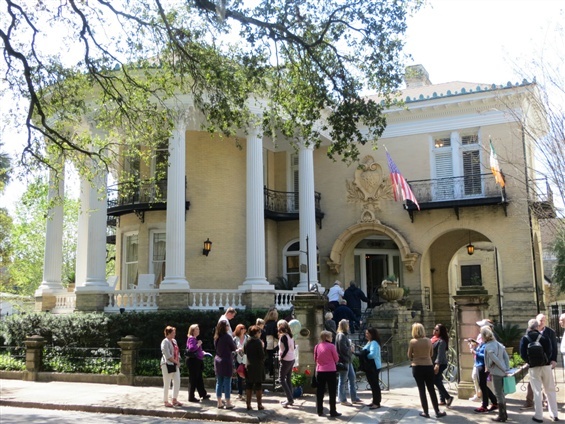 In a move as significant as any in the history of modern Savannah, a bridge club group of seven women formed the Historic Savannah Foundation, raised $22,000 and bought the Davenport House, saving it from the wrecking ball. 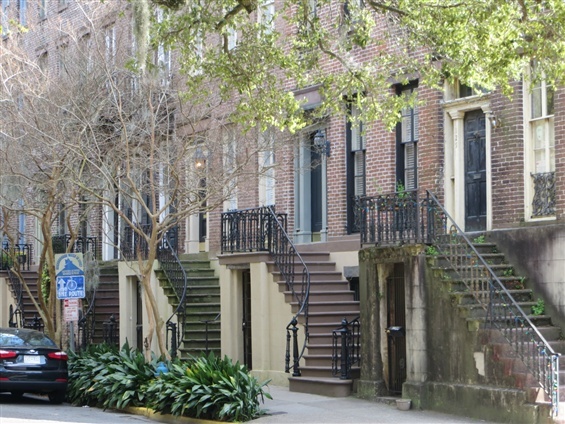 They embarked on similar projects throughout the city and inspired many others to join in their campaign to save Old Savannah. One of those who joined the fight was Jim Williams. 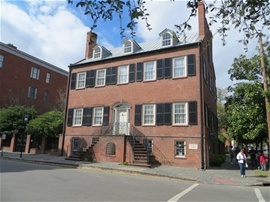 Mr. Williams, who, in his early teens, began his career as a high-end antique dealer and art restorer in Savannah purchased the Mercer House in 1964 at the age of 24. 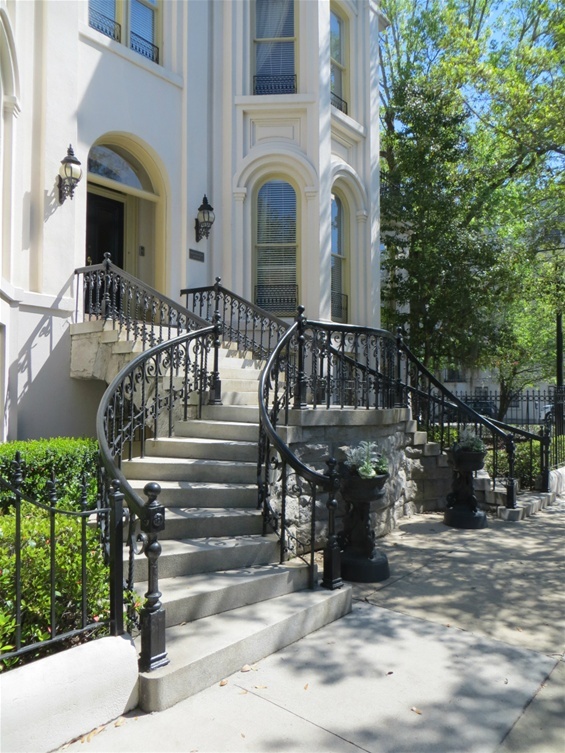 The home was originally commissioned by General Hugh Mercer (the great-grandfather of Savannah's most famous son, the legendary songwriter Johnny Mercer - more about him later). The house had served as headquarters for the Shriners (who reportedly drove their tiny motorbikes up and down the marble corridors) and had fallen into serious disrepair. 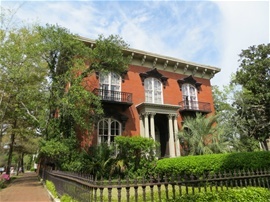 After years of restoration, much of it done by Williams himself, he made it his personal residence. 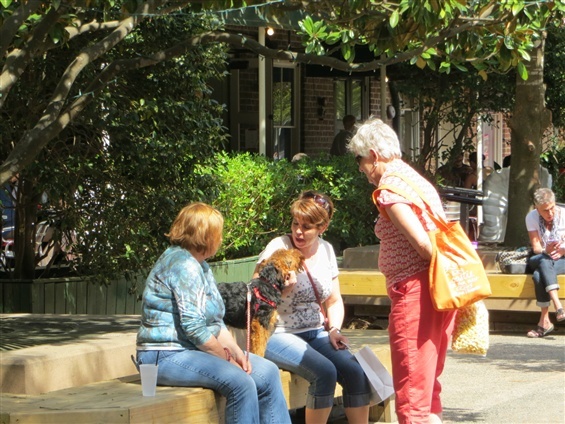 It stands today as one of the showplaces of Savannah and contains an unmatched collection of furnishings and art. Williams became a Savannah sensation, adored and reviled but never ignored. His extravagant holiday parties were the stuff of legend. 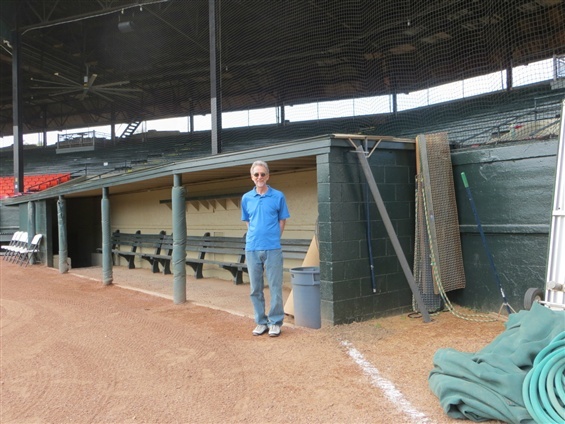 In 1981 Jim Williams shot and killed his assistant. He went on trial for murder - four times!!!! The first two trials ended with guilty verdicts. Both were overturned. The third trial ended in a hung jury (with one "not guilty" holdout). The fourth trial (1989) put an end to the matter with a finding of "not guilty". 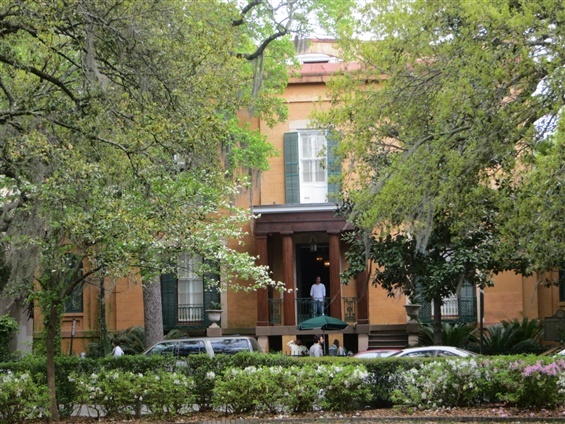 Williams died shortly thereafter leaving a considerable legacy, having restored not only what is now known as the Mercer-Williams House but over 50 other homes in Savannah and about a dozen other classic properties in Georgia and South Carolina. 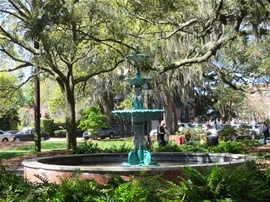 In 1995, when Savannah was still somewhat off the main tourist route, the saga of Williams and the series of murder trials was transformed into a global best-seller, "Midnight In The Garden Of Good And Evil". 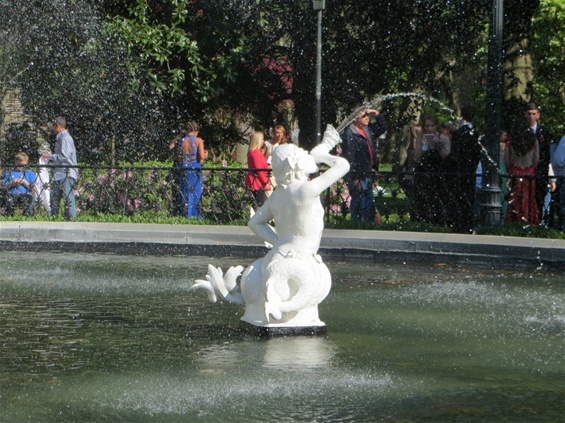 The citizens of Savannah were scandalized. Some because they were named in the book. Some because they were left out. Two years later the book was turned into a movie directed by Clint Eastwood, starring Kevin Spacey as Jim Williams. The tourist gold-rush was on. Overnight Savannah went from a relative backwater to a mecca for millions of fans of "Midnight". 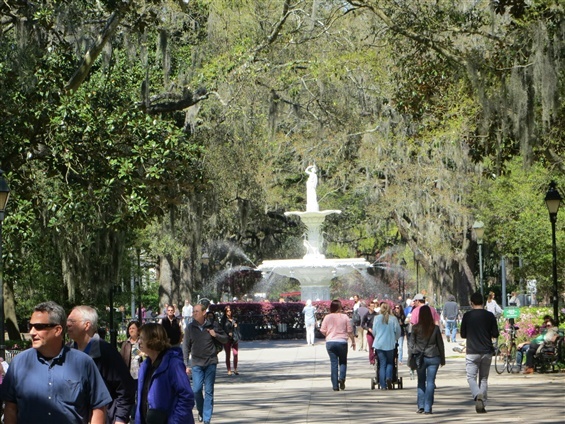 Although the "Midnight" specific tourist trade has died down somewhat, the general flood of visitors to Savannah continues unabated. They really don't need names do they? So, what did we do for fun? Well, the homes and the history of course. But the beer halls ( www.crystalbeerparlor.com ) and the beach were a close second. 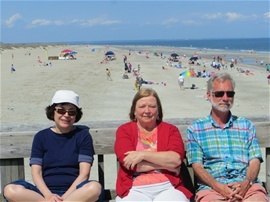 Savannah has, essentially, it's own beach - Tybee Island. 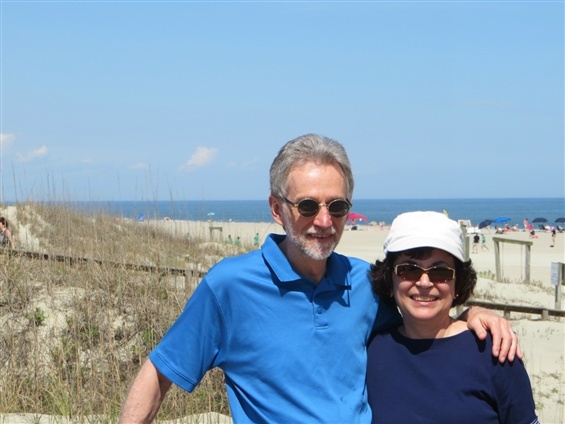 About 20 miles away, it has long stretches of white sand and warm water. In the summer it's packed. But in April, despite the 80 degree temps (and 65 degree water) most natives think it's way too cold, so things are a bit more manageable. Oh yes, on the way to the beach I had the best meal of the trip - grilled flounder at "The Flying Fish". Nothing fancy at this shack - just fresh fish. Johnny Mercer, who was born and raised in Savannah, is one of the most prolific songwriters in American history. He wrote literally thousands of songs (many of them in 20 minutes or so) and won 4 Academy Awards. He's most famous for "Moon River" but he also won Academy Awards for "On the Atcheson, Topeka and the Sante Fe", "Come Rain or Come Shine" and "The Days of Wine and Roses". There are dozens of other instantly recognizable lyrics that flowed from the pen of this master. 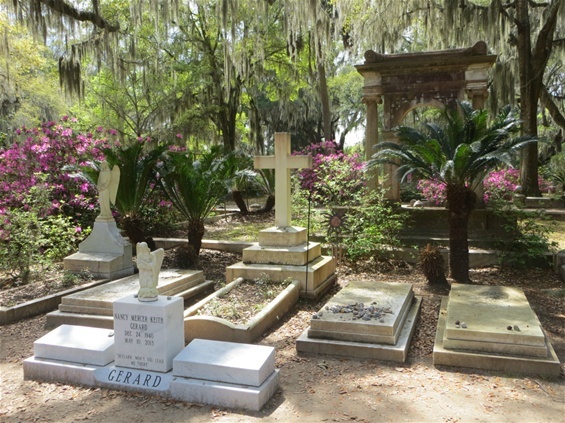 He is buried in Bonaventure Cemetery on the outskirts of Savannah. Bonaventure is a rambling, somewhat worn and weary looking place. Since cemeteries, even famous ones, are generally not overrun with tourists, it was easy to guess that most of the few people that were in the cemetery were there to visit its most notable citizen, Mr. Mercer. Eventually, we found his family plot, thanks in large part to a woman who was chaperoning four teenage girls. 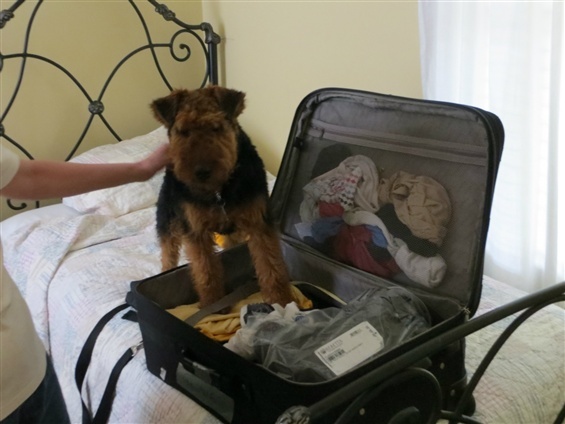 She was keen on the experience of visiting the gravesite. The girls? Not so much. She said the girls were an a capella singing group and prompted them to sing something. We didn't know exactly what to expect. We were about to be serenaded by a group of reluctant teenagers in front of the final resting place of one of the greatest lyricists of modern times. How was this going to turn out? In teen lingo - OMG!!! The girls broke out into a pitch perfect rendition of "Panis Angelicus" (The Bread of Angels) one of the most moving songs in all of Christendom. Goose bumps. A tear in everyone's eye. It could hardly have been more moving. By the way, "And The Angels Sing" (one of Mercer's songs) is inscribed on his tombstone. Indeed. 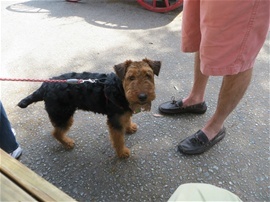 "Rudy - The Little Dog of Savannah"
Thanks to Rudy. Thanks to my brother and sister-in-law for hosting us. Thanks to Savannah, one of the glories of the South. 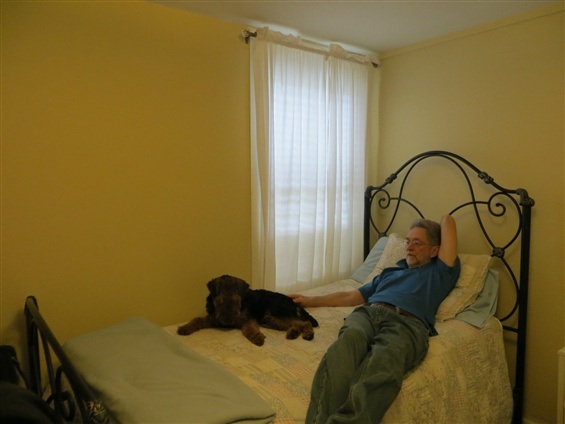 Engaging, pleasant travelogue, Gary. Too bad you can't have some Mercer tunes play in the background while your followers read this. Thanks. Where next? Thanks so much to everyone who enjoyed the trip to Savannah. 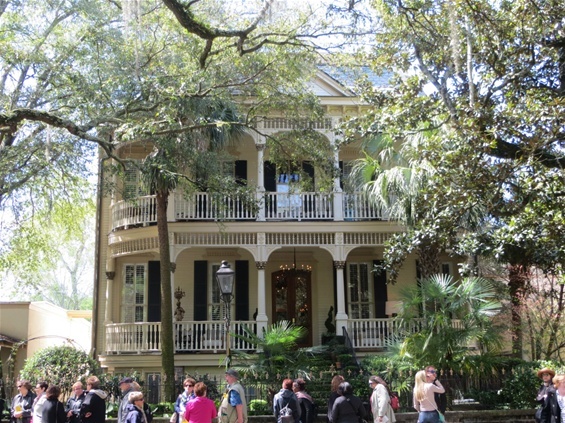 Makes me want to travel to Savannah! Keep living the dream! Good story and great pictures!